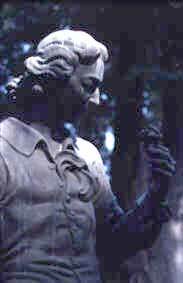 The young Linnaeus: statue by Carl Eldh in the Linnaeus’ Garden. Photo: Hans Odöö Carl Linnaeus was born in Råshult, Småland, in 1707 on May 13th (Old Style) or 23rd according to our present calendar. At the age of two he moved with his family to nearby Stenbrohult. His father Nils was a clergyman but gardening was his hobby so Carl became interested in Nature at an early age. Nevertheless, he was meant to follow in his father's footsteps and take holy orders. However young Linnaeus played truant in order to be out of doors. His teachers lost patience and summoned his father Nils. Later in life Linnaeus writes about this incident:" The teachers recommended his father to apprentice his son, as soon as possible, to some craftsman since they were convinced that he could make nothing of book-learning". Nils Linnaeus was horrified but was soon reassured by the natural science teacher, Dr Rothman, who thought that the medical profession might be an alternative. Since "medicine" in those days implied all kinds of natural science, this suited young Carl very well. His father had to adjust to the situation but shirked telling his wife this news for several months.